As El Salvador's government moves forward with new measures trying to control gang violence in the country, the powerful gangs which control many neighborhoods released videos declaring a temporary halt to killings. 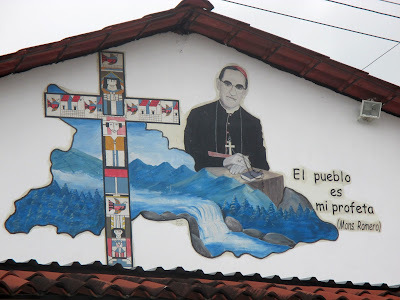 Today, March 24, is the 36th anniversary of the assassination and martyrdom of Salvadoran archbishop Oscar Arnulfo Romero. He was slain by a marksman's bullet as he said mass in the chapel at the Divina Providencia cancer hospital in San Salvador. Today he is officially called "Blessed" after his beatification by the Roman Catholic church on May 23, 2015. 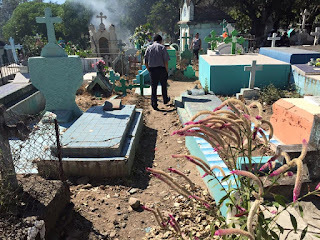 El Salvador is in the midst of a concentrated national campaign to control the Aedes aegypti mosquito which carries the Zika virus as well as dengue and chikungunya. The campaign runs throughout the months of March and April and involves actions at the department, municipality, colonia and individual house level to destroy and control the breeding grounds of the mosquitoes. Already the country has seen a reduction from 12% to 8% of homes where mosquito larvae were identified. On this Monday of Semana Santa in El Salvador, enjoy photo galleries of processions of the faithful in the streets of the country over the weekend. On Saturday, there was the annual march to commemorate the martyrdom of Oscar Romero, as documented in a photo gallery from El Blog. The website of ContraPunto shares colorful photos from Palm Sunday celebrations. LaPrensaGrafica also has a photo gallery. EDH shares photos as school students reenact the events of Holy Week. Semana Santa / Holy Week begins in El Salvador this weekend. It is a time of both religious devotion in the historically Roman Catholic country, as well as family vacation time. In the days before Holy Week each year, the government's security and rescue forces assure the public that they are fully prepared to provide security during the week of festivities, vacation and tourism. El Salvador's right-wing ARENA party is calling for the resignation of current Minister of Defense David Munguia Payes. They want him to resign for having allegedly approved the awarding of benefits to gang members in connection with the 2012 truce when he was Minister of Public Security. A quick trip to the ARENA website shows dozens of other press releases attacking the FMLN government of Mauricio Funes for its role in the 2012 truce process with the gangs. Yet the hypocrisy of this position was exposed Saturday with the publication of a video. El Salvador's top government leaders have been meeting to consider implementing "extraordinary measures" including the possible declaration of a "state of exception" to combat gang violence. A declaration of a state of exception could involve the suspension of certain constitutional protections, the imposition of curfews, and the ability to detain persons without cause for extended periods of time. On March 8, El Salvador's Supreme Court, President Salvador Sánchez Cerén, and lawmakers considered a plan to implement a state of exception in the country's most violent municipalities, reported La Página. The proposed state of exception would likely affect at least ten municipalities, including the capital city of San Salvador. The bloody surge in gang-related violence which made El Salvador the world's murder capital has continued through the first two months of 2016. During the first two months, 1399 homicides took place, more than double the same period in 2015, and a rate of almost one murder every hour of every day. In addition, ten police officers have been killed so far in 2016, continuing a death toll which saw 61 officers killed in 2015. The truce among gangs and the government, which dramatically lowered homicide rates in 2012-13, has long since disappeared. With all the bad news about El Salvador related to gang violence and corruption investigations, you might expect that its economy would be in a tail spin. In fact, the economy is not that bad -- not great, but also not in decline. According to El Salvador's Central Reserve Bank (BCR), El Salvador's economy grew at a rate of 2.5% for 2015, the highest rate in 7 years. The bank also reported that real wages grew at a rate of 7.2% last year. Direct private investment in the Salvadoran economy grew $600 million to $1.23 billion, and foreign direct investment grew as well, a vote of confidence in the economy. The inflation rate for the year was just 1%. According to BCR figures, in 2015, El Salvador's exports grew by 4%, and its trade deficit fell by 5.9%. El Salvador was one of only two economies in Latin America and the Caribbean to record such export growth.